:Rev. 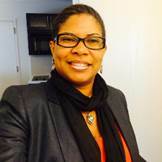 Dr. Joy Denise Carrington is the Director of Campus Ministries at Norfolk State University. This is a ministry of the United Methodist and the Presbyterian Churches seeking to impact the College, the Community, and the Current Culture with Christian Principles, Open Hearts and Open Minds. 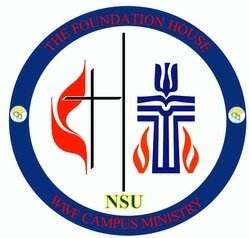 The ministry seeks to provide a safe place to explore and to experience one's faith, while offering a respectful and non-threatening environment of love, service to others and learning. The College's slogan may be "Bring a Spark. Light a Fire." John Wesley, the founder of Methodism (and namesake of our college) emphasizes that ​fire represents not the end, but a beginning. Wesley wrote, "Catch on fire with enthusiasm and people will come from miles to watch you burn." Enthusiasm refers to ultimate meaning in our lives. What is the broader meaning of life? That is the most significant question each of us faces. Spiritual life on campus addresses that question in many ways. 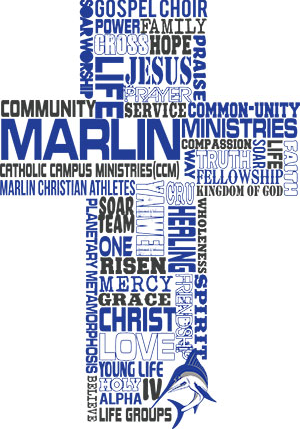 The mission of the Marlin Ministries and the Chaplain's Office is to provide a Christian inter-denominational campus ministry of discipleship, evangelism, service, counseling, hospitality and faith-related educational initiatives to students, faculty, staff, alumni and friends of Virginia Wesleyan College. 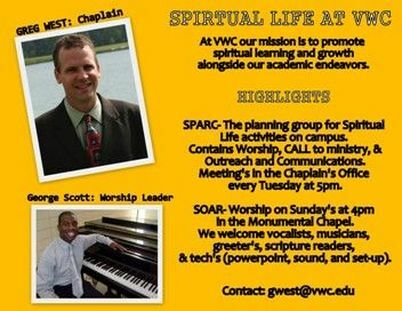 ​The Chaplain is available to assist students of other faiths gather together and create community on campus. 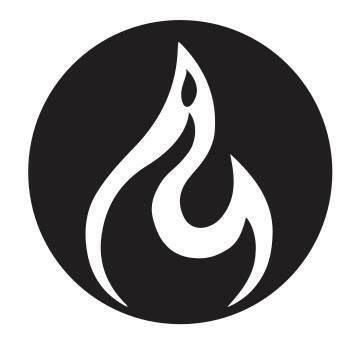 ​You could say that IGNITE is a church, but they are not your typical church. The belief of this ministry is that . . . "church is a verb: it is who they are." They believe they can make a difference in the community where they are; and they believe that the church has the power to change the world. Learn more about the pastor, Brandon Robbins, and the vision for this exciting ministry. IGNITE & Through HIS Hands would be extremely grateful for any monetary or canned food donations. Please email: info@throughhishands.org, or call (757) 905-3720.